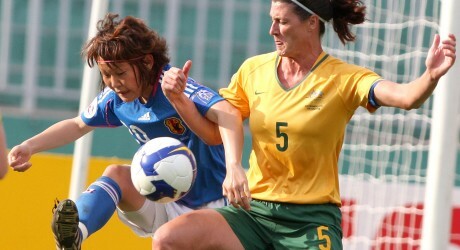 Cheryl Salisbury (right) in action for the Matildas in the third-place match of the Asian Football Confederation Women’s Asian Cup in Vietnam on 8 June, 2008. Source: Asian Football Confederation. Who is Australia’s most capped footballer? Ask around and you will get many different answers because the Football Federation Australia has a list which only includes full ‘A’ internationals against overseas countries, while many games in the early days were played against club sides. Even if you find the man with the greatest number of appearances for Australia you will still not have the right answer, for Cheryl Salisbury has more caps than any of them, 151 in all when she retired in 2009. Yet she still does not have an entry in the Australian player data-base on the Ozfootball site. Born in Newcastle in 1974, Cheryl took up football as a highly active seven year old, playing in a boys’ team. She played with the Lambton Jaffas as a junior, coached by Brian Stephenson. She was a regular with the team from the Under-10s through to the Under-16s. In 1988 she was selected for the Australian schoolgirls team. By 1990 she was in the senior side at Lambton, but continued to play with the youth team winning the Newcastle grand final in 1992. She also had seasons with Adamstown in the New South Wales Women’s State League and Stirling Macedonia. The Adamstown experience was unique in her early club career—the rest of it was spent playing in boy’s or men’s teams. In April 1994 she began her extraordinary senior international journey when she was selected to play against Russia, scoring on debut in a two-one loss. Later that year she scored twice against Papua New Guinea in a seven-nil rout, which helped Australia qualify for the 1995 World Cup in Sweden where she started in two of three matches. She took part in the World Cup in the United States in 1999 and scored against China. Salisbury proved to be strong versatile player, being used by coaches in attack, midfield and defence. In the match against China, Australia was down to ten players early on after Alicia Ferguson was sent off. Salisbury kept pounding up and down the field and was rewarded with a goal after 66 minutes as the Matildas lost by three goals to one. She was part of the Matildas team which played in the Olympic Games in Sydney in 2000. In 2003 the World Cup was back in the United States and Australia lost to Russia and Ghana and drew with China with Salisbury ever present. From 2003 on she captained the Matildas, leading by example. In the Olympic Games in Athens in 2004 the Matildas lost to Brazil by a single goal by the superstar Marta, then beat Greece and drew with the Unites States, but this was not enough to qualify for the next stage. In 2007 Salisbury scored for a FIFA World eleven against China, the first Australian to do so. She had a superb tournament as Australia reached the knock-out stages for the first time in the World Cup in China. A four-one win over Ghana and draws with Norway and Canada saw the Matildas through to meet the mighty Brazil. An injury to Salisbury saw her replaced by Kate McShea after only 20 minutes as the Matildas ran the Brazilians close only to go down by the odd goal in five. Cheryl Salisbury had played in four World Cups for Australia, a record which is never likely to be equaled. To extend her knowledge of the game and to help pay the bills she played for three seasons in Japan’s L-League and in the United States W-League with Memphis Mercury and New York Power. She played with Newcastle Jets in the A-League from its inception in 2007 and did a great deal to promote the game at all levels. She retired on 31 January 2009 coming off the field to a standing ovation after scoring in with a penalty kick against Italy at Parramatta Stadium in Sydney in her final match, bookending her career with goals. She earned the respect of all who played with her. In 2009 she became a member of the Football Hall of Fame. She continued her involvement as coach of Broadmeadow Magic, taking the team to a championship in the Northern New South Wales Premier League. She has a horse race named after her at Newcastle, as is the medal for the women’s player of the year in the W-League. In 2010 her son Nate was born and for the first time football had to take a back seat to family for Cheryl Salisbury, a genuine star of the game and its most capped Australian.